Memorial notices marking the 100th anniversary of the death of 32 soldiers from Northamptonshire who lost their lives in the First World War are being placed in the Chronicle & Echo by a local history group. The touching tributes were the idea of the Hackleton World War One History Group and started in December last year. In the week that each man lost their life 100 years, the group place an In Memorium notice in the family announcements pages. Jo Wilde, from the group, said there were 120 men who went to war from the villages of Horton, Hackleton, Piddington and Preston Deanery. Thirty-two of them died. “We had the idea of doing some research about what life was like and the lives of these soldiers but because there were so many of them who served, it was too big a task. “Instead, we concentrated on those who died and this started about 18 months ago. “The events of World War One may by 100 years ago but their sacrifice is still relevant to the people of today,” Mrs Wilde said. The group contacted Hackleton Parish Council, which was keen to support the project, and memorium notices have appeared in the monthly magazine as well as the Chron. “We felt it would be a fitting tribute to the soldiers and might generate some interest and information from family members who have moved away. The next announcement will appear in Thursday’s Chronicle & Echo marking the death of Captain Dudley Dixon Winterbottom. “He was the boy from the ‘big house’, Horton Hall, and was the son of the owner. He served in the Second Batallion Manchester Regiment and was enlisted on September 30, 1914. He was killed during an attack on Achi Baba on August 7, 1915 aged 23,” Mrs Wilde said. 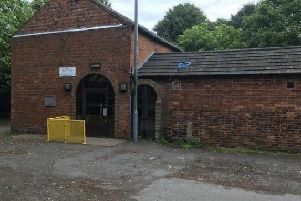 When Captain Winterbottom died he was honoured by the parish and the village memorial hall in Hackleton was dedicated to his name and is still called the Dudley Winterbottom Memorial Hall. The group, supported by the parish council, is holding an exhibition, Discovering Our Heroes, at the memorial hall on September 19 and 20 and will feature information about the men who gave their lives.